When it comes time to build a new barn including an ESF system, the process can seem overwhelming. If a new barn is in your future, or even if you hope that it is in your future—it is worth checking out this infographic and article explaining what you can expect from the process. As barn design partners we recognize how very important it is to find that ideal builder to work on your space. You need someone you can trust with your money, time, and livelihood. Talk with your builder about your goals for the barn as well as your concerns. Ask if they have experience gaining clearances from your local governing authorities. The more familiar builders are with you and your goals, the better they can serve you. Acquiring the necessary permits can be one of the more lengthy processes in building; so establishing a schedule from the beginning will help you and your builder to have realistic expectations. Matt Williams from Heartland Builders always cautions that a timeline is guideline. There is no "typical" build. But there are some general guidelines that can help you shape your expectations. It is wise to consider and even view several barn styles and layouts in person. Talking to other producers will help you learn from their mistakes and improve on their successes. It will also allow you to improve communication with your builder on your exact wants and needs. This is the part where we come in! As barn designers, we help improve the functionality of the planned structure by giving input and design ideas and helping you select the appropriate ESF system. It is so vital to find a partner who will do more than just sell you the ESF equipment and penning and gating for your barn. You need a team that will serve you throughout the life of your equipment and offer critical guidance, suggestions and support as you grow your operation. Find a barn design team you can trust and connect them with your builder early on in the process so they can work together before the cement is poured. 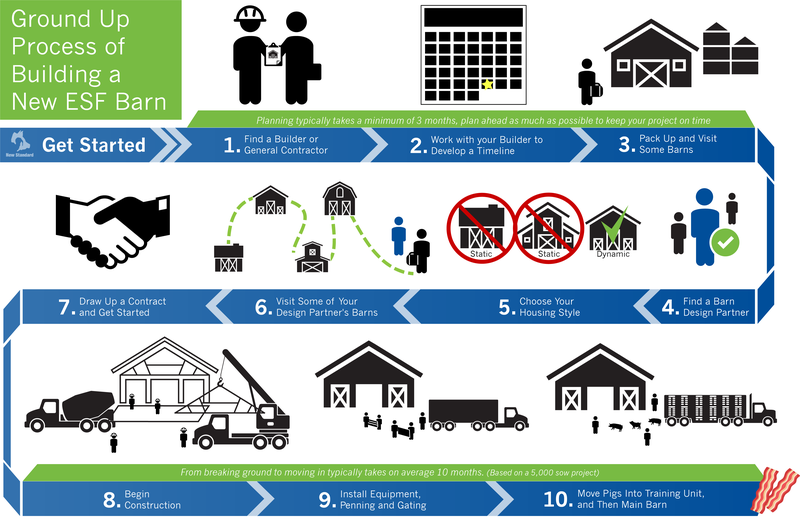 Your barn design partner can help you work through this process, likely by visiting a few of their barns (step 6). With ESF the big decisions are if you will be doing small static or large dynamic groups and if you will be doing post-implantation reentry or post-insemination reentry. Your chosen housing style will dictate some of the features needed in your new barn. At New Standard, for new builds we usually suggest large dynamic groups; and we always advocate for post-insemination reentry because we believe that the whole point of group housing is to have the sows in groups as much as possible. Once you're comfortable with your design partner, it is time to sign on the line and get the process started. Communicate your expectations clearly throughout this process and be sure to ask questions. We always love it when our customers have questions because we can build our relationship and ensure we are all on the same page. This is the point where reality sinks in. Once all the permitting is in place, the experts are on board, and the choices are made it is time to step back and let the builders do what they do best! This process can be quite short or very quick depending on your barn type, housing style, and even the time of year. The end is in sight! Penning and gating goes in at this stage. We usually recommend PanelTIM to our customers because of it's versatility, strength, durability, cleanliness, and the fact that it is environmentally friendly. Installation begins on the ESF system and we begin working on a plan to train and transfer your animals to the new barn. Once the building is complete, it is time to move in the pigs. We usually recommend our new builds include a gilt development unit and a training pen to get animals used to the ESF system gradually. This engages the gilt or sow's natural sense of curiosity leading them to naturally accept the ESF system in stages. As sows and gilts move through the training program, they then enter the main gestation pens in the barn. Before you know it, you are at full capacity. We hope that this simple overview was a helpful glance at a typical new build scenario. We've definitely had barns that vary from this process, so this is just meant to be a general guideline. If you have questions about how your farm can implement ESF, click below to learn more about how data can truly drive production goals.